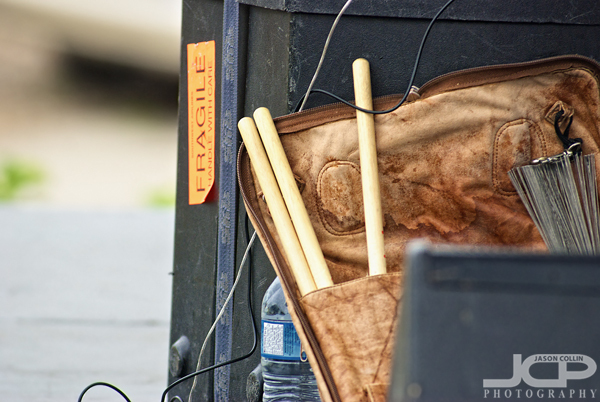 These drumsticks & their case interested me - Nikon D80 Nikkor 80-200mm @ f/4 ISO 400 1/200thI first and foremost make photographs that interest me. This for the most part even applies when I am shooting for a client as I trust they hired me because they liked my past work and know that I will bring that same perspective to their shoot as well. I made this drumsticks shot while shooting a Brett Eldredge concert for an event client. This photograph may have no interest to anyone but me, but that does not come into my thinking at all when I made the image. I was drawn to the satchel the sticks were sticking out of in particular. It looked very old and worn and thus must have a great story behind it. I never talked to the drummer about it, but I wanted to make a photograph of it for my own memory and for me to wonder what might be the origin of the satchel, was it his father's before him, or given to him by a drummer he looked up to? Those questions interest me, even if I can never get an answer to them. I included this image in the 240+ I delivered to the client. It may just be a throwaway image, but for me it will be a reminder of that concert and shooting that job. Shooting what interests you first and foremost is what one should really only ever do in one's personal shooting. I cannot imagine doing otherwise really. When just going out shooting (not for a client) why would you ever shoot anything that does not interest you? Likewise, shooting something you think will be interesting to others, but is not interesting to yourself, I cannot imagine the point in doing that and I would also imagine the results of those photographs would be very subpar at best. If no one else in the world finds the photograph interesting, but you do, then that is still a successful photograph. That is my thinking. Reserve your own 1-on-1 DSLR Photography Lesson shooting or editing with Jason today!